Art Exchange Gallery has been providing art to live with since 1992. We feature landscape paintings, Native American Indian art, portraits, drawing, sculpture, prints and jewelry. 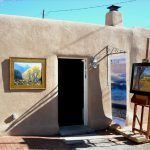 Some of our notable artists include Rance Hood, Al Bahe, Willie Murphy, Jeff tabor, Brad Price, Curtis Tabor, Taos artists, Santa Fe artists, Trinon Crouch, Richard Tashjian, (Armenian artist) and many others. The Arcade is on the Plaza in downtown Santa Fe, New Mexico. We sell paintings, drawings, sculptures, prints, ceramics, and objects of art by thirty-seven artists from around the country. Since we came to New Mexico we have accepted several new artists, mainly from the Santa Fe area. These new artists have added the southwestern flare that is needed for this Santa Fe gallery. We spent two years at this location. 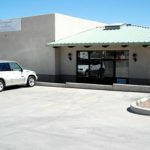 22 Bisbee Ct. Santa Fe, NM 87508. We are no longer at this location. We had a good run on Canyon Road, meeting new friends, patrons, and artists! As we outgrew this location we found a great location with enough space to include artist studios. Thus the move to the Bisbee Ct. location. The Art Exchange Gallery began in Acton, Massachusetts in September 1992 on the second floor of the historic Exchange Hall building. The 2,500 square foot space allowed us to rent space to artists and provide an exhibition area as well. The gallery benefited the community providing art exhibits, art classes, and cultural events as well as allowing clients to visit artists in their studios. … The Acton location closed in 2005.